Oil analysis is important to determine the condition of the insulating oil present in the Transformers and some types of switchgear. One of the most important functions of transformer oil is to provide electrical insulation. Any increase in moisture content can reduce the insulating properties of the oil, which may result in dielectric breakdown. Water and oil, due to their differing chemical properties are not mutually soluble. However, up to a certain limit, a small amount of water will dissolve in the oil. This limit is a function of the temperature of the system and the solubility increases exponentially with increasing temperature. This is of particular importance with fluctuating temperatures because, as the transformer cools down, any dissolved water will become free, resulting in poor insulating power and oil degradation. A point to note is that as the oil ages in service, a certain amount of oxidation occurs which changes the chemical makeup of the oil. This, in turn, allows more water to dissolve. In addition, many transformers contain cellulose-based paper, which is used as insulation in the windings. Again, excessive moisture content can result in the breakdown of this paper insulation with a resultant loss in performance. The moisture content of the oil is determined using a coulometric Karl Fischer instrument. This is an extremely sensitive test and can detect water at levels down to a few parts per million. The dielectric strength of transformer oil is a measure of the oil’s ability to withstand electrical stress without failure. Because transformer oils are designed to provide electrical insulation under high electrical potentials, any significant reduction in the dielectric strength will indicate that the oil is no longer able to perform this vital function. Some of the things that can cause a reduction in dielectric strength include contaminants such as water, sediment, conducting particles, oil degradation by-products and cellulose paper breakdown. The test method for determining dielectric strength is relatively simple and involves applying an AC voltage at a controlled increasing rate to two electrodes immersed in the transformer oil. The gap is a specified distance and when the current arcs across this gap the voltage recorded is used to determine the dielectric strength. Just like lubricating oils, transformer oils are oxidized under the influence of excessive temperature and oxygen, particularly in the presence of small metal particles which can act as catalysts. Oxidation products are usually acidic in nature and result in an increase in acid number. Further reaction of these acids with the bulk oil can result in sludge and varnish deposits. In the worst case scenario, the oil canals become blocked and the transformer is not cooled adequately, which further exacerbates oil breakdown. Furthermore, an increase in the acidity has a damaging effect on the cellulose paper. 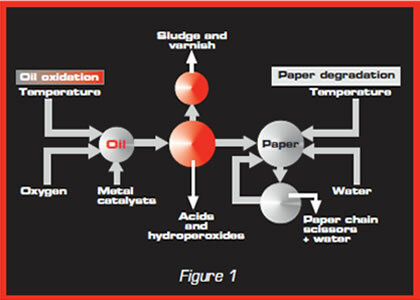 Oil degradation by-products such as acids and hydro peroxides also generally have the ability to conduct an electrical charge, which in turn reduces the insulating properties of 2the oil. An increase in acid number often goes hand in hand with a decrease in dielectric strength and increased moisture content as shown in Figure 1. The solid insulation (cellulose-based products) in transformers degrades with time at rates which depend on the temperature, moisture content, oxygen and acids in the insulation system. Heat and moisture are the main enemies of the solid paper insulation with oxidation as the primary culprit. When degradation occurs, the cellulose molecular chains (polymers) get shorter. Chemical products such as furanic derivatives are produced and dissolve in the transformer oil. Of the furanic compounds, 2-furaldehyde is the most abundant. 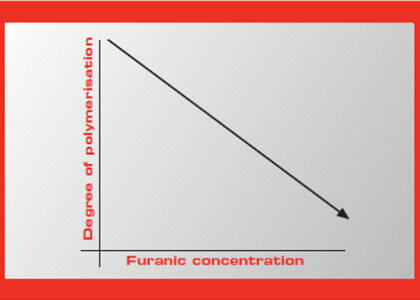 Its concentration in oil has been related to the degree of polymerization (DP) and consequently to the physical strength of the solid insulation (see Figure 2). The cellulose materials are the weakest link in the insulation system. Since the life of the transformer is actually the life of the cellulose insulation, and degradation of the cellulose is irreversible, the decay products should be removed before they can do any further damage to the cellulose. With proper maintenance the cellulose can virtually have an indefinite life. 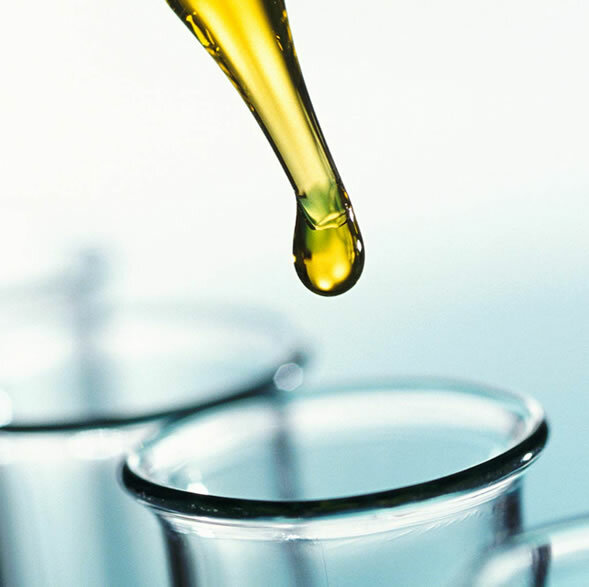 To test for furanics, a sample of the oil is obtained and certain chemical techniques are used to extract the furans from the oil. The extract is then analyzed using a process called high performance liquid chromatography (HPLC). The results are usually reported in terms of parts per billion (ppb). The analysis of gases from petroleum products has been performed for decades using gas chromatography. However, this technique was not applied specifically to transformer mineral oils until the late 1960s or early 1970s and is now commonly called dissolved gas-in-oil analysis (DGA). DGA has become a standard in the electrical maintenance industry throughout the world and is considered to be the most important oil test for transformer oils in electrical apparatus. More importantly, an oil sample can be taken at any time from most equipment without having to take it out of service, allowing a “window” inside the electrical apparatus that helps with diagnosing and troubleshooting potential problems. As the insulating materials of a transformer break down from excessive thermal or electrical stress, gaseous by-products form. The by-products are characteristic of the type of incipient fault condition, the materials involved and the severity of the condition. Indeed, it is the ability to detect such a variety of problems that makes this test such a powerful tool for detecting incipient fault conditions and for root cause investigations after failures have occurred. Dissolved gases are detectable in low concentrations (ppm level), which usually permits early intervention before failure of the electrical apparatus occurs, and allows for planned maintenance. The DGA technique involves extracting or stripping the gases from the oil and injecting them into a gas chromatograph (GC). is not widespread. The concentration of the different gases provides information about the type of incipient fault condition present as well as the severity. 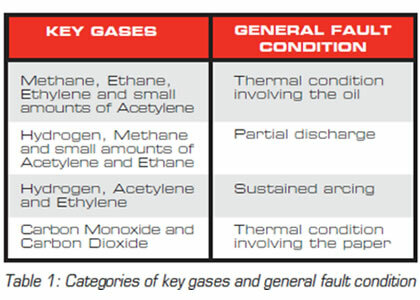 For example, four broad categories of fault conditions have been described and characterized in Table 1. The severity of an incipient fault condition is ascertained by the total amount of combustible gases present (CO, H2, C2H2, C2H4, C2H6, CH4), their rate of generation and their ratios with one another. Generally, transformers will retain a large portion of the gases generated and therefore produce a cumulative history of the insulating materials’ degradation. This is an important tool for detecting and trending incipient problems. However, it also means that care is needed in interpreting values for a first time analysis on service-aged transformers (several years old), which could contain residual gases from previous events. Some gas generation is expected from normal ageing of the transformer insulation and it is therefore important to differentiate between normal and excessive gassing rates. Normal ageing or gas generation varies with transformer design, loading and type of insulating materials. Routinely, general gassing rates for all transformers are used to define abnormal behaviour. Specific information for a family of transformers can be used when sufficient dissolved gas-in-oil data is available. Acetylene is considered to be the most significant gas generated. An enormous amount of energy is required to produce acetylene, which is formed from the breakdown of oil at temperatures in excess of 700ºC. Excessively high overheating of the oil will produce the gas in low concentrations. However, higher concentrations are typically symptomatic of sustained arcing, a more serious operational issue that can cause a transformer failure if left unchecked. DGA is used not only as a diagnostic tool but also to stem apparatus failure. Failure of a large power transformer not only results in the loss of very expensive equipment but it can cause significant collateral damage as well. Revenue losses due to operational outages may be the least worrisome consequence of a failure. Replacement of that transformer can take up to a year if the failure is not catastrophic and can result in tremendous revenue losses. If the failure is catastrophic, then additional losses could occur, such as adjacent transformers, environmental problems from the release of oil (which could be as much as 20 000 liters), and the resulting fire that would have to be contained and smothered. In order to avoid such a failure, the sample frequency of most large power transformers is between one and three years. However, sampling frequencies will increase as an incipient fault is detected and monitored. Often sampling frequencies are dictated by insurance requirements, which often stipulate that annual transformer oil analysis must be conducted to ensure continued coverage. PCBs (polychlorinated biphenyls) are a group of synthetic oil-like chemicals of the organochlorine family. Until their toxic nature was recognized and their use was banned in the early 1980s, they were widely used as insulation in electrical equipment, particularly transformers. Three types of PCBs are normally used in electrical transformers: Aroclor 1242, 1254 and 1260, commonly known by various brand names which include Askarel, Chlorectol, Elemex, Inerteen and Pyranol. One of the most important problems with PCBs is that they concentrate in the fatty parts of microorganisms. This concentration factor between the organism and the water can be as much as a million times. Concentrations are further amplified as the microorganisms become food for animals further up the food chain, ultimately ending up in humans. PCBs are very stable and their degradation process is slow, making for yet greater amplification in organisms. Although not overly toxic in themselves, PCBs are poisons, which have been shown to cause damage to the reproductive, neurological and immune systems of wildlife and humans. Far more serious are the risks of a fire or an explosion. At temperatures around 500ºC, extremely toxic compounds - polychlorinated dibenzofurans (PCDF) and polychlorinated dibenzodioxins (PCDD) – are formed. Small amounts of these compounds have been found at accidents where transformers and capacitors have been exposed to fire or have exploded. Even if the amounts have been extremely small and have caused no personal injuries, it has been necessary to perform very extensive and costly decontamination work. PCDDs and PCDFs cause damage and death in doses as low as 1ppb to 5000ppb. They are some of the most potent cancer promoters known and can damage organs such as the liver, kidney and digestive tract as well as cause miscarriage and sterility. Regular purification of insulating oil is necessary to ensure longevity of your transformer. Oil Purification lowers moisture, solids and gaseous contaminations. The regeneration process of oil removes by-products such as acids, Aldehydes and Peroxides that causes sludge to form in the transformers.